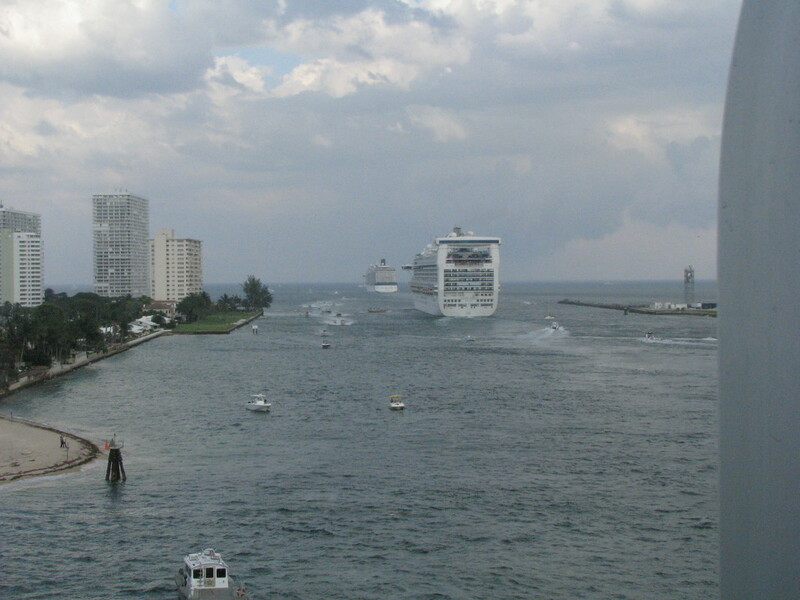 ​Arrival At Airport And Transfer To Ship: We flew into Ft. Lauderdale to sail later that day. Usually we come in at least a day early so we were a little apprehensive about arriving on time. Everything went smoothly, no delays or bad weather! The baggage claim area was extremely crowded with representatives from several cruise lines holding signs to guide cruisers to the correct station. The Princess representatives were located adjacent to where we claimed our luggage. 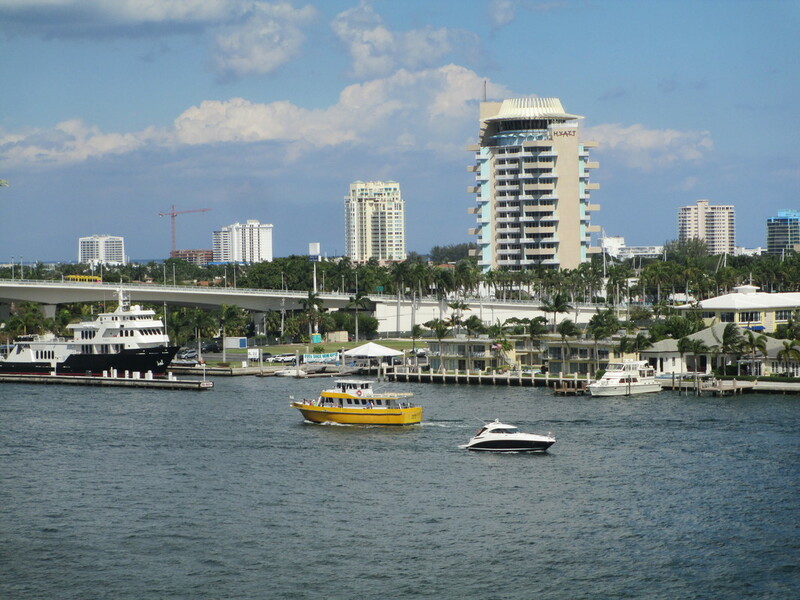 Since we had purchased a ship transfer, we were immediately escorted to the waiting coach and driven to Port Everglades. (Note: Transfers could also be made from the Miami airport. If landing in Ft. Lauderdale, another option would have been a taxi. 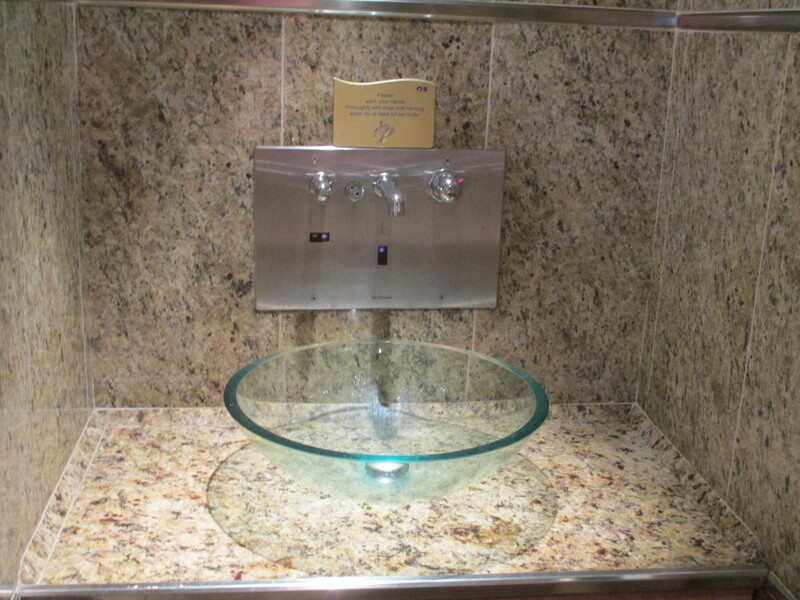 It probably would not have been very expensive since the port was only a few miles away from the airport.) Every vehicle going into the port had to stop to show authorities a boarding pass for a ship. Lines moved quickly so our coach was soon dropping us off at the Regal Princess. 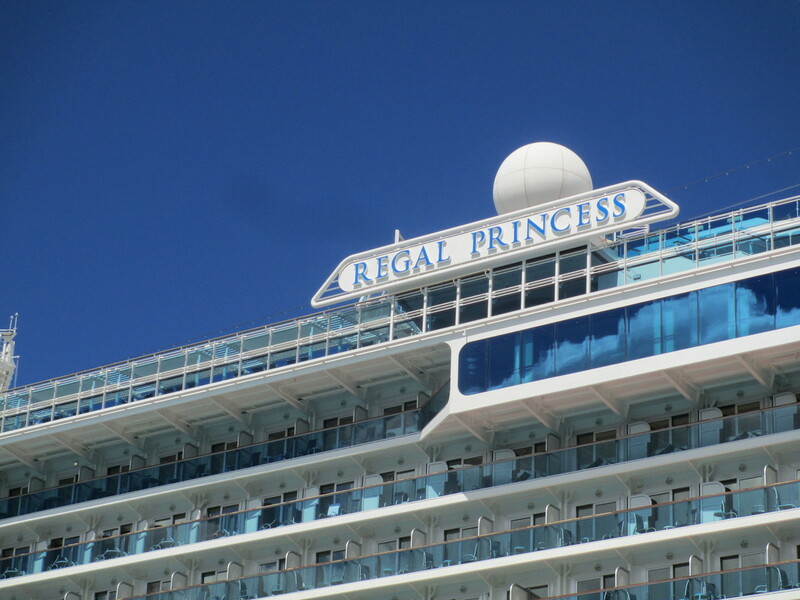 Our luggage was taken to the ship for us so all we had to deal with was our carryon luggage. Embarkation: Next step was for us to get in line to go through the embarkation process. Since we had reached “platinum” level after our last cruise, we enjoyed “preferred boarding” which meant we didn’t have to wait in a long line. So nice!! The process went quickly. 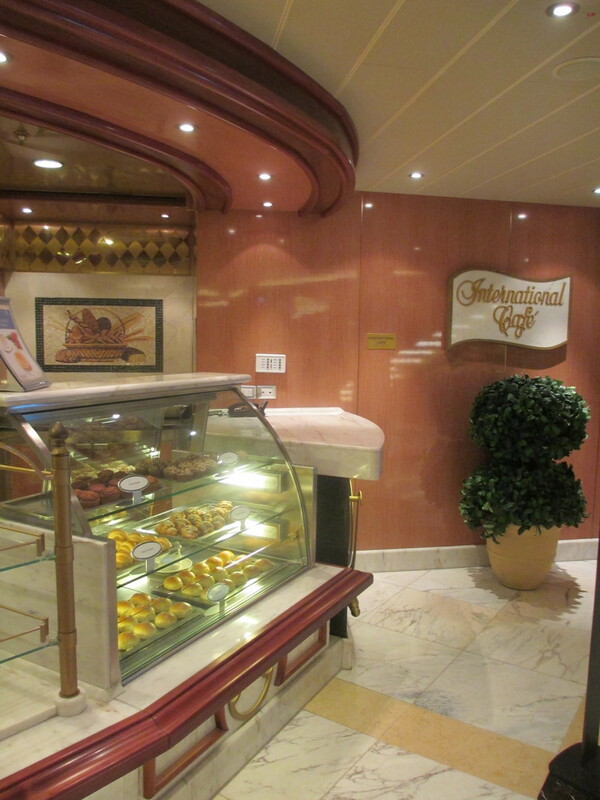 After we received our cruise card, we boarded the ship and went to our stateroom to drop off our carryon luggage. Our first surprise was the balloons at our door in celebration of my birthday. Didn’t know Princess knew! 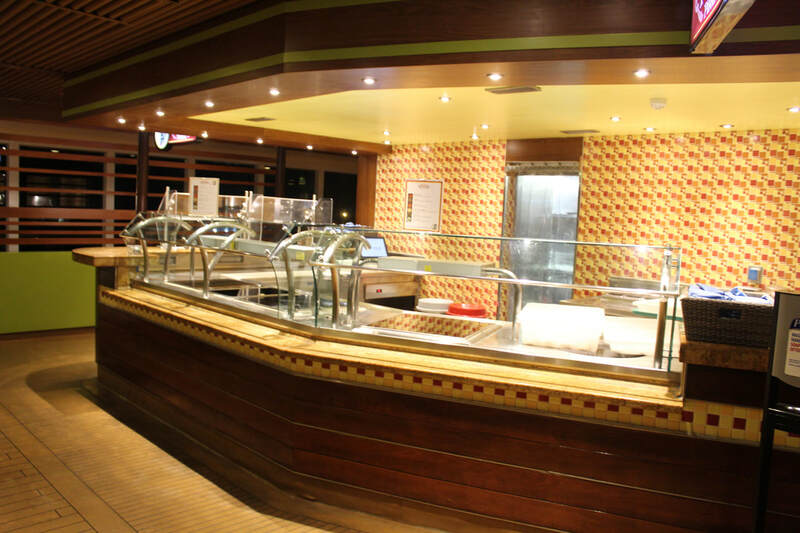 Lunch: There were several places available for lunch including the Horizon Court/Bistro (Deck 16 Aft), Concerto Dining Room (Deck 6 Midship) and International Café (Deck 5 Piazza) as well as the Prego Pizzeria (Deck 16 Midship) and the Trident Grill (Deck 16 Forward). 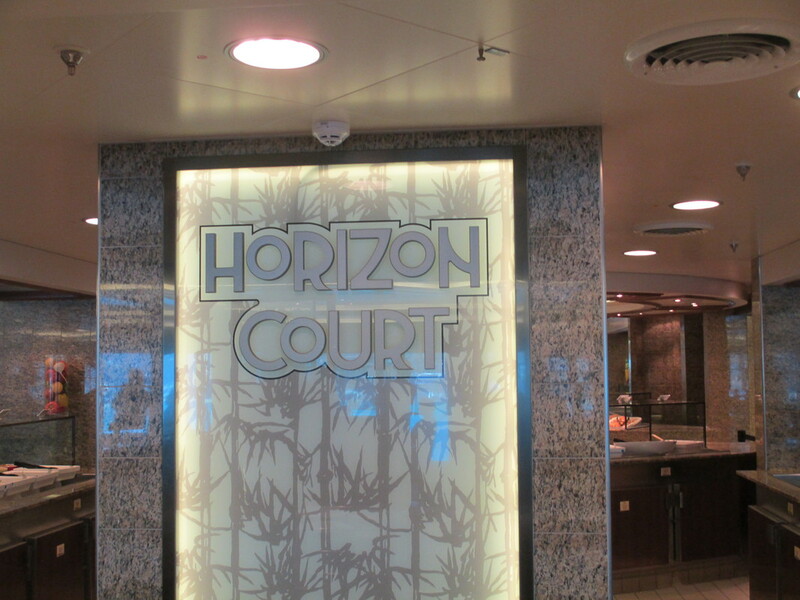 We chose the Horizon Court on the Lido Deck. There were several lines with many food choices so that the area did not seem crowded at all. One thing that I really appreciated was that the napkin with silverware was already at the table so that you didn’t have to try and balance a plate full of food and your silverware while locating an empty table. Afternoon Activities: From 11:30 to 2:30pm the $1,000 Treasure Hunt was taking place. You were given a card with spaces indicating areas of the ship that you have to go to in order to get a stamp on your card. After completing all the spaces, you returned the card to the Piazza area to qualify to win great prizes. Basically, this Treasure Hunt took you on a tour of the ship and acquainted you with areas that you might not otherwise visit. 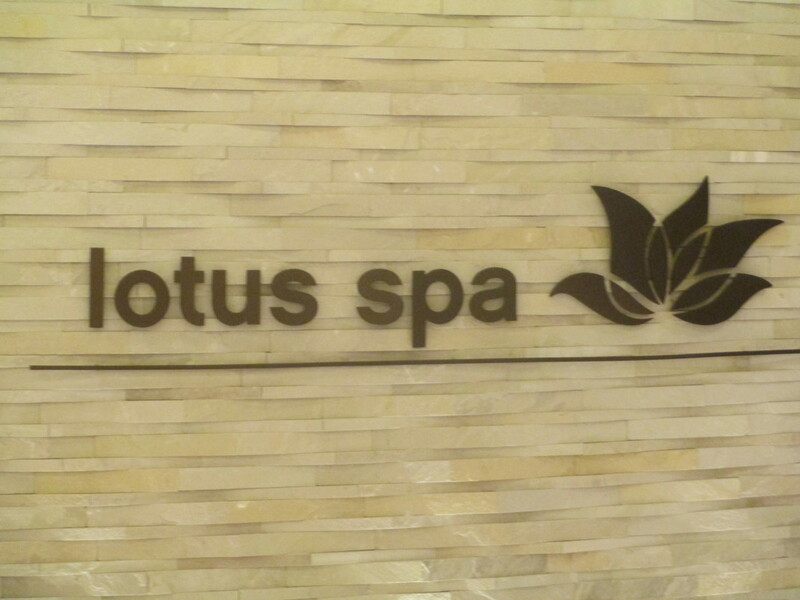 Another special activity was the Lotus Spa (Deck 5, Fwd) tour taking place from 1:00pm to 10:00pm. The tour provided an opportunity to view the spa and see what was available while experiencing free massage tasters! Muster: Passenger Emergency Drill (Muster) must be carried out before sailing. It is a requirement of law and all passengers must attend. So at 3:15pm the alarms sounded and everyone proceeded to their assigned station where emergency information was given. The ship’s personnel demonstrated the proper way to wear the life jacket that each person brought from their room. Everyone had their cruise card scanned and those who were not present for the first muster had to attend the second drill a little later in the afternoon. The drill was well organized and didn’t take too long to complete. Shortly after the first muster, the ship set sail for Amber Cove. Ships moving through channel to open sea. Regal was next to go. 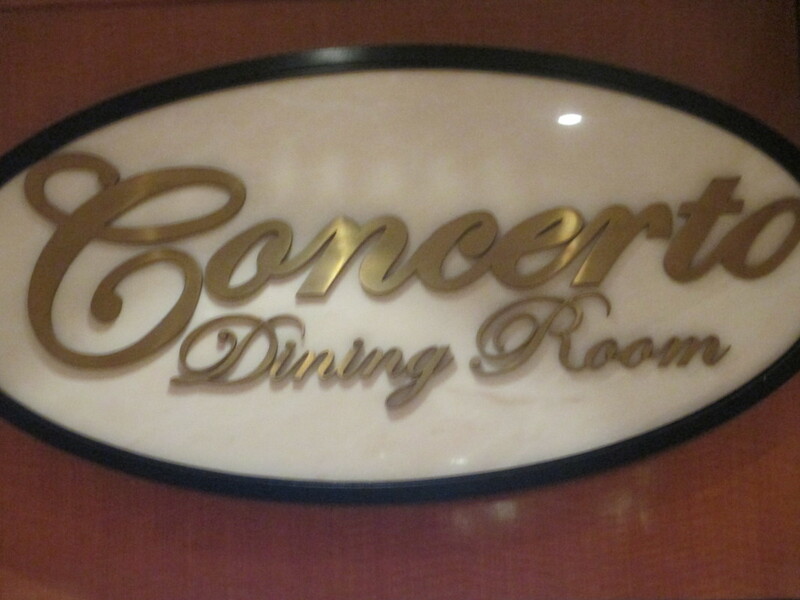 Dinner: We had chosen to have Anytime Dining each evening in the Symphony Dining Room. The scheduled time was from 5:00 to 9:30pm. Since we enjoy eating early, we were there each evening at 5:00pm. 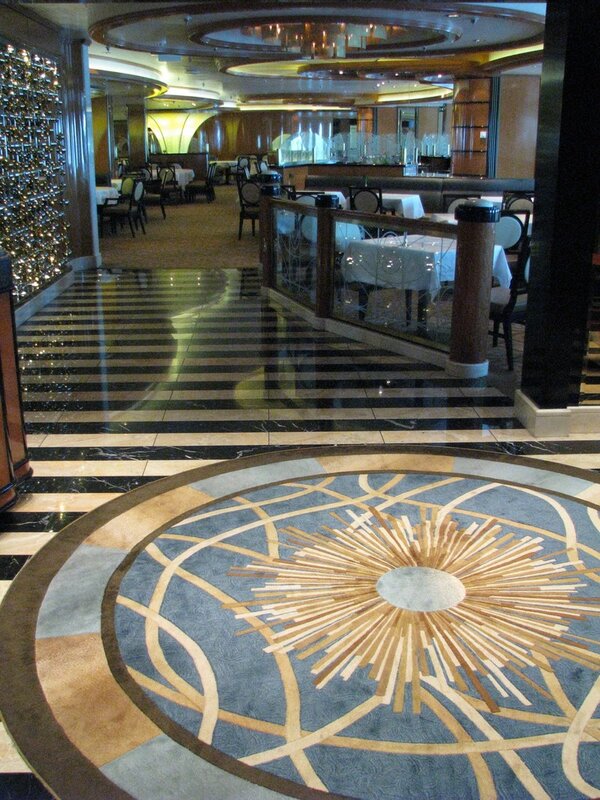 This dining room can not only seat large groups but also had many tables for just two diners, much more than on previous ships. 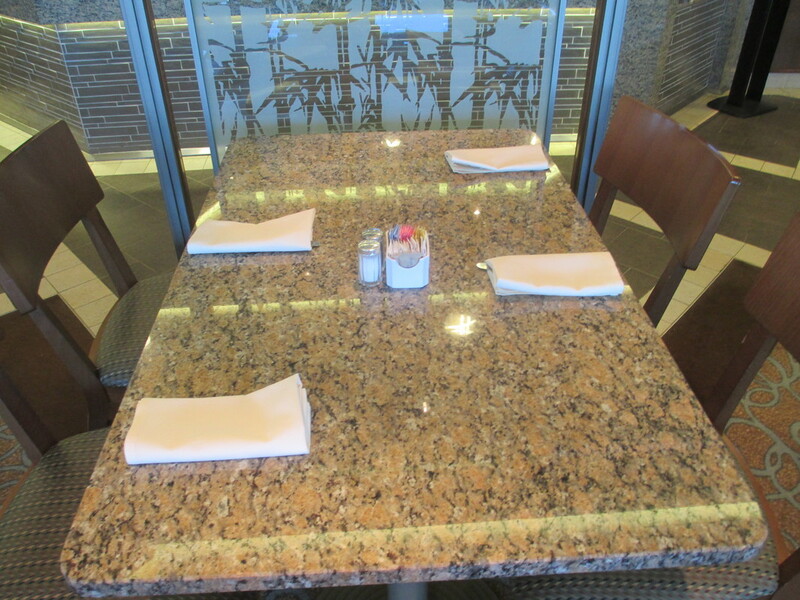 Our waiters were very efficient, professional as well as friendly, so we asked for their table each night of the trip. 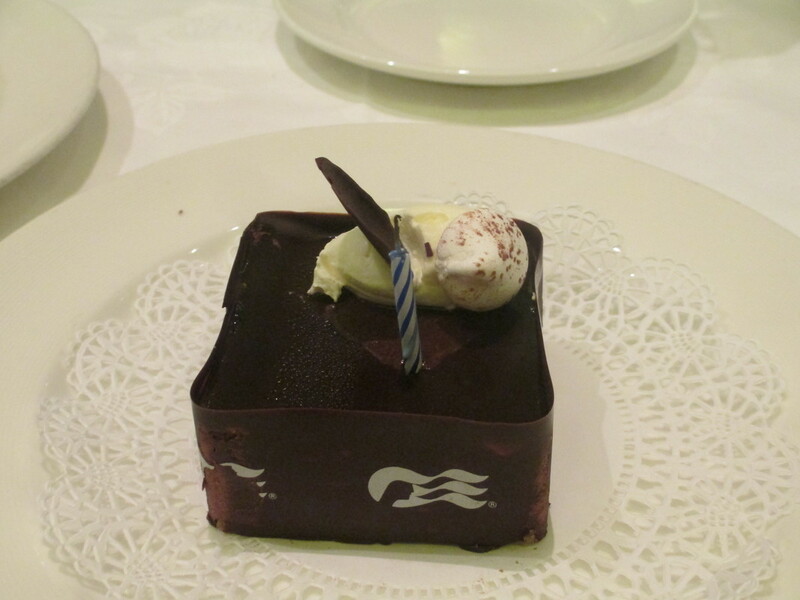 At the end of the delicious dinner, I had my second birthday surprise – a small dark chocolate birthday cake presented by singing waiters. What a way to extend a birthday!! Entertainment: Since we had an early dinner, we were able to catch the 7:00pm Welcome Aboard Showtime in the Princess Theater, (Decks 6 & 7 Fwd). 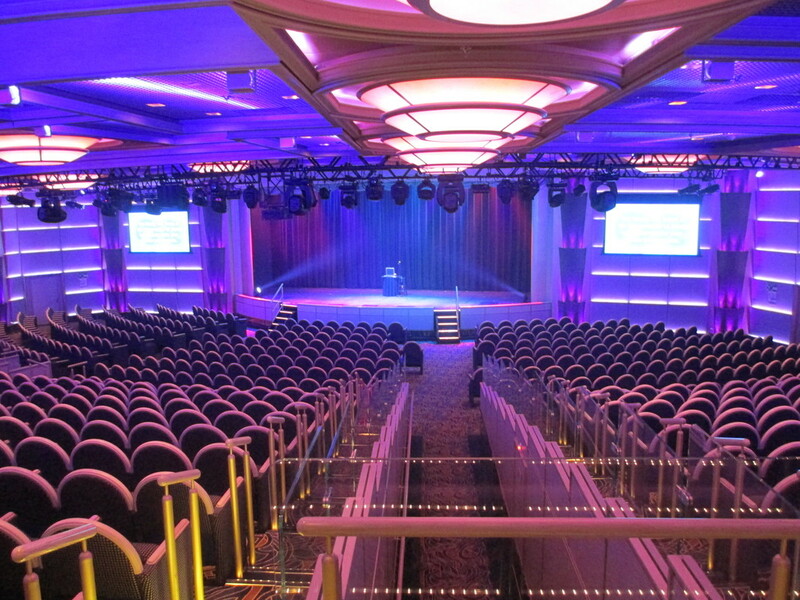 The show was a preview of the entertainment we could expect in the following days showcasing the Regal Princess singers and dancers, the orchestra, and comedian Steve Moris who was formerly with the Beach Boys. After the performance, there were many other opportunities for entertainment throughout the ship, but since we had been up before the crack of dawn, we decided to call it a night. 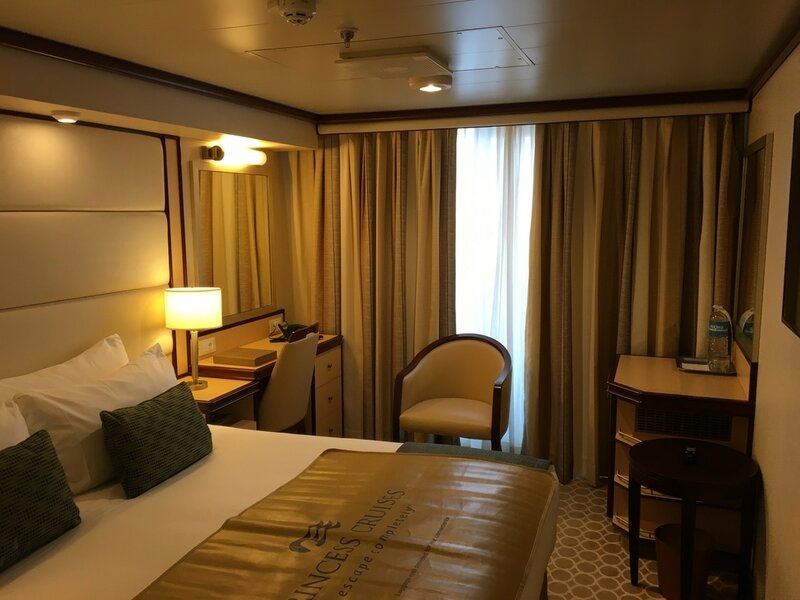 When we got back to our stateroom, our wonderful steward had already turned down our bed and left two chocolate candies for us. Check Out Day 2's Review!